My delay in posting was due to a good thing. A really good thing, actually. My husband and I spent a week in Las Vegas and renewed our vows while there. It was wonderful! As with any trip such as this, my Facebook profile was lit up with tons of photos and plenty of “check ins” at places such as the Bellagio or the Stratosphere (that’s where we renewed our vows!). One of my posts received a whopping 100+ likes! I think that was a record for one of my posts! The only down side to our trip was the red-eye flight home last Saturday night. We boarded a plane at 10:50 pm and arrived back home at 10:30 the following morning. Yea, it was not fun. Both of us spent a lot of time on our smart phones surfing social media and playing games as we sat around waiting for our flight. I realized, in my exhausted stupor during the red-eye, that I spend a lot of time on Facebook reading other people’s posts. I mean a LOT of time. I don’t post nearly as much as I read. It’s my way to catch up with others, see what everyone is up to, and sometimes find an inspirational something or another. That night, in the wee hours of the morning, I saw a post from a friend that lives out west. They were responding to comment someone posted on their profile. In a nutshell, this friend of mine is one of those super happy people who is always posting about how great life is, what a great day they are having, etc. I actually enjoy his posts because he really does try to enjoy life and encourage the rest of us to do the same. I guess someone got fed up with the “happy happy joy joy” posts and commented something like, “It must be nice to have a perfect life when others are suffering.” To that, my friend posted a long list of the junk he has to deal with every day – it’s just that he chooses not to complain about it on Facebook. I’ve had those moments, so I sympathize with the person who commented. I’ve been guilty of reading these “my kids/husband/life are/is perfect” posts that friends post daily and feeling that twinge of “ick” in my gut as I wonder why I can’t have that perfect life too. When my marriage was struggling it was especially hard to read those “my husband did this amazing thing for me” types of posts. It’s difficult not to compare our lives to others when we have such easy access to everyone’s private moments via social media. What used to be private is now for public consumption so we are inundated with everyone’s joy, sadness, and every other emotion 24/7. 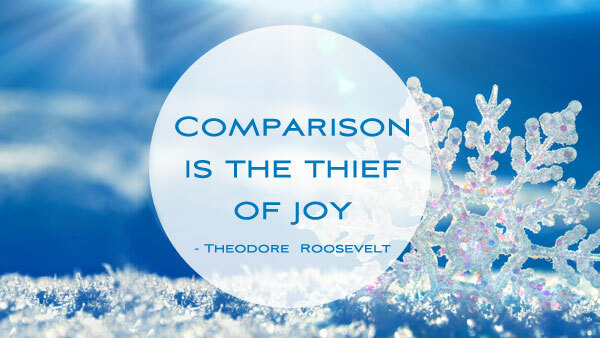 Comparison to others can chip away at the joy we could choose to have – like my “happy” friend chooses every day. Just choose to be happy and enjoy life! As I continue exploring a better attitude in my life, I write this encouraging us all to have the attitude of appreciation for who we each are individually. One thing I can say for certain is that we may think this person or that has a perfect life/marriage/family/job/etc., but nothing is ever perfect. Everyone has junk – it just looks different from person to person. Take social media with a grain of salt and remember that most people won’t post the bad, only the good, so you’re only getting half the story. And, if you’re like me you have some friends who post mostly bad . . . that, too, is only half the story. My goal is to have an attitude of appreciating who I am and not dwelling on what I’m not. How about you? Do you compare too much?